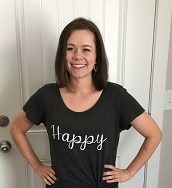 I try to plan delicious meals for my family, but sometimes, because of time or ingredients, I look for "filler" recipes- things that I can use to fill up the empty spots on my meal plan calendar, but are still healthy and tasty and I can call dinner;). Baked potatoes are one of those meals that is so basic, we probably don't think about it very often. I love baked potatoes as a side when we are having some kind of meat, but I often forget that they can be quite filling, especially if you give them a little help! There is no limit to what you could add to a baked potato. 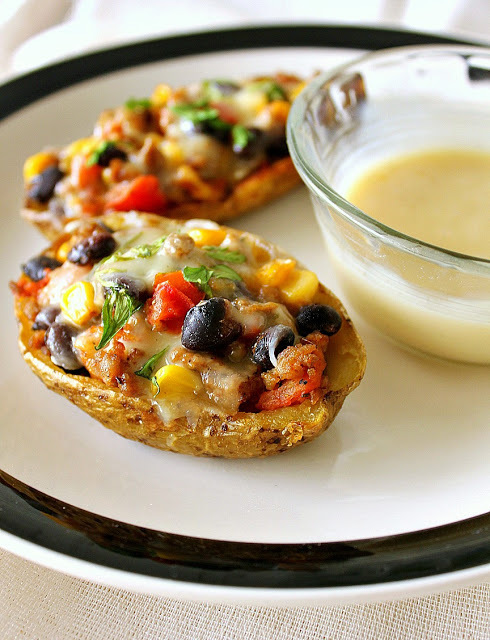 Think of some of your favorite veggies, toppings, or dressings, and try different combinations with your baked potato! 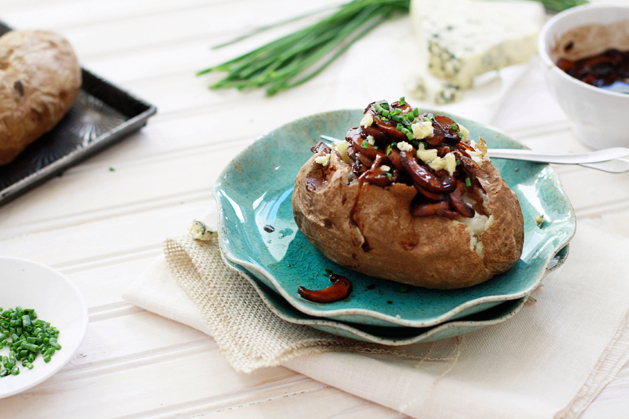 *Mushrooms, and caramelized onions- this just sounds heavenly to me! 2 of my favorite things in one bite? I'll take it:). The website where I found this idea suggested caramelizing your onions in a balsamic vinaigrette dressing for even more delicious flavor! You could just use a cream of mushroom base as well if you are cooking for picky eaters;). *Fill your potato with grilled veggies such as peppers, onions, and zucchini. You could also add some meat such as sausage or grilled chicken to add some protein. *Add tomato sauce, lots of cheese, and some pepperoni slices for pizza potatoes! You could also add some veggies (green peppers, tomatoes, etc.) to this one. *Make a breakfast baked potato! You can add scrambled eggs and sausage, or give it a Mexican spin and add tomatoes, salsa, and avocado. *Add chili- canned is easy, but you could use all that leftover chili from your favorite chili recipe too;). *Puree cauliflower with the inside of your baked potato and top it with broccoli and cheese (a sneaky way to get more veggies on the table;). *Use pecans, cranberries, apples, or any other seasonal foods for a festive and delicious dish. 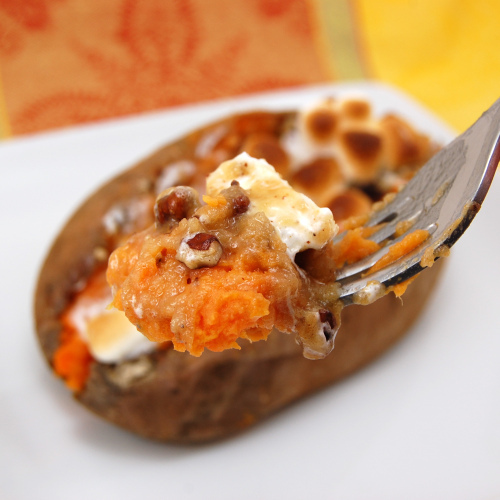 *Try this recipe for twice baked sweet potatoes with cinnamon cashew cream! YUMMY!! *Here's a recipe for a baked sweet potato with pecan and marshmallow streusel- oh my goodness! I don't know why I never thought to try some of these variations. My husband really doesn't like plain baked potatoes- but who could resist some of these?! I'm pretty sure I could get him to eat a Southwestern Baked Potato;). 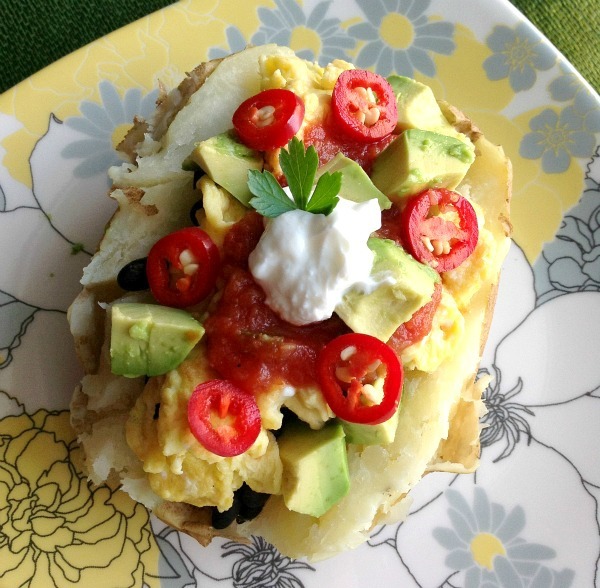 Does your family have a favorite way to eat a baked potato? What other variations have you tried? Leave a comment below! 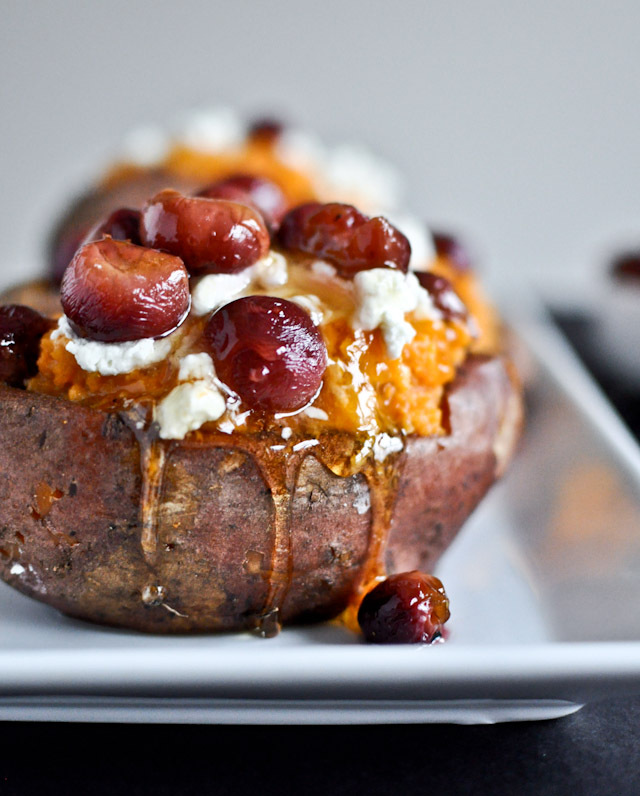 These twice baked sweet potatoes with cinnamon cashew cream are a healthy way to indulge. 1. Wash sweet potatoes and poke holes in the exterior with a knife. Wrap tightly in aluminum foil and bake at 350 degrees for about 80-90 minutes or until flesh is soft when touched. 2.Remove from oven, slice down the middle lengthwise and carefully scoop out flesh into a large bowl, keeping the skin intact. Set aside. 3. Drain cashews and add to a food processor. Process until finely chopped. 4. Add almond milk, honey, cinnamon and nutmeg and continue processing until smooth and creamy. 5. Add ? of the cashew cream* mixture to the sweet potato flesh and mix to combine. 7. Scoop sweet potato and cashew mixture back into the potato skins. Sprinkle with brown sugar and broil on high for about 10 minutes until the tops start to brown. 8. While potatoes are broiling, heat a small skillet over medium-high heat. 9. Add olive oil and sage leaves and quickly pan-fry the sage (about 5 mins). 10. Remove potatoes from oven and top with fried sage leaves. Preheat the oven to 350 degrees F. Spread the pecans onto a baking sheet and place in preheated oven 5-7 minutes until fragrant. Shake the baking sheet halfway through baking so the nuts will toast evenly. Remove nuts from oven and set aside to cool completely. Turn the oven up to 400 degrees F.
Wash the sweet potatoes, scrubbing them well to remove any dirt. With a fork, prick the sweet potatoes in a couple of spots and place them on a sheet pan. Bake for about 45 minutes, or until a knife inserted in the center goes in easily. Remove from oven and let stand until cool enough to handle but still very warm. In a large bowl, mix 3 tablespoons butter and brown sugar together until it's crumbly-looking. Add the cinnamon, nutmeg, ginger, salt, and half of the pecans. Divide mixture in half. Add half of the mixture to the sweet potato flesh and fold in completely. Add the filling back to the potato skins and place on baking sheet. To the remaining brown sugar mixture, add 3 tablespoons butter, flour and remaining pecans. Mix until crumbly looking. Top sweet potatoes generously with the brown sugar mixture and marshmallows and return to the oven. Bake for another 5-10 minutes, or until the marshmallow topping is golden brown.